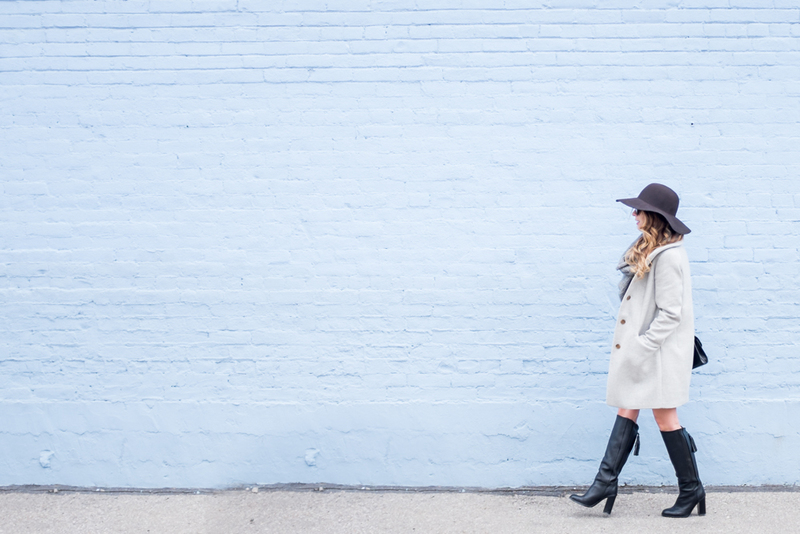 December 2015 | La Petite Noob | A Toronto-Based Fashion and Lifestyle Blog. Wow - not to sound cliché but can you believe that we're at the last day of December, let alone 2015? This has been the most incredible year for me and, while I'll be dedicating a whole post to the year in review, December was a great month and I discovered many new local hangouts and great products. 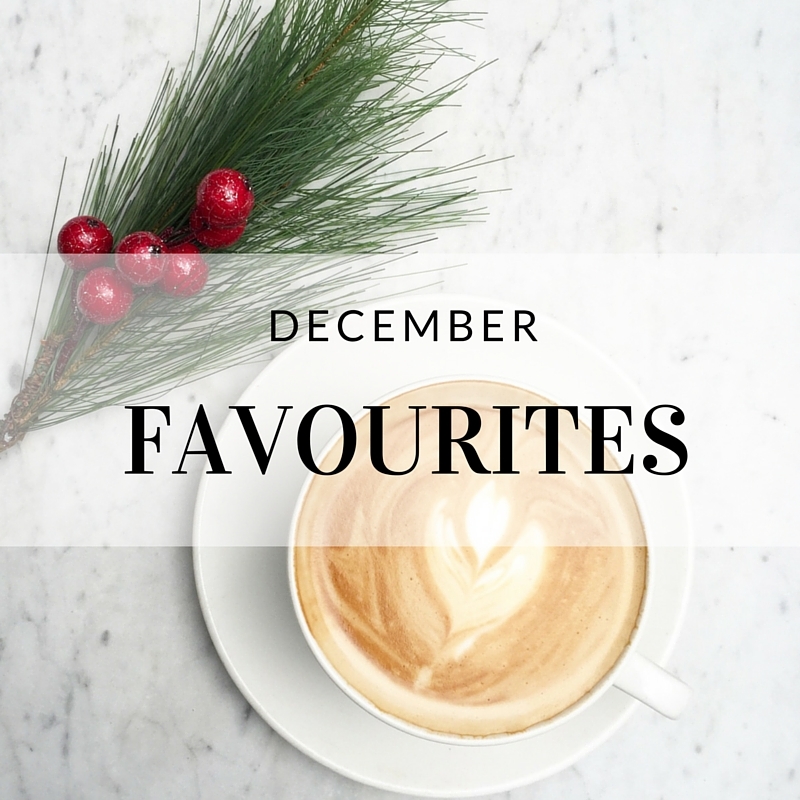 Take a look at my absolute favourite things for the month of December. I had the pleasure of joining Gabriella of Pastels and Pastries, Siffat of Icing and Glitter and Tara of The TL Blog for an incredible brunch at Colette in The Thompson Hotel in Toronto. 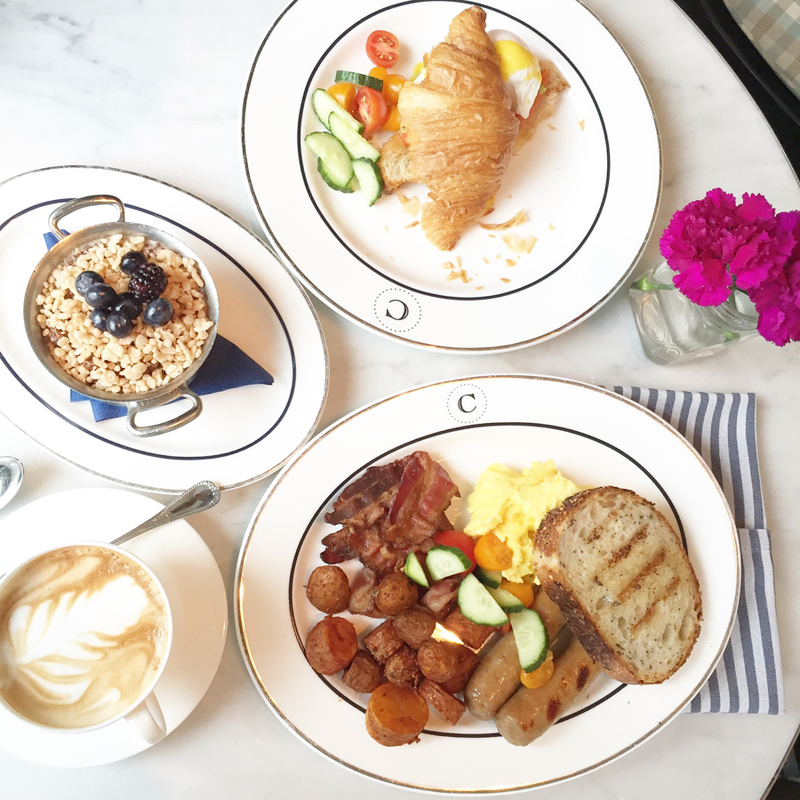 My local ladies know that Colette is a sort-of blogger mecca for brunch, with its bright marbled interior and Parisian feel. I had high expectations for the brunch itself and believe me, it didn't disappoint. The quality of the food is absolutely incredible, with everything made in-house and fresh as could be. Although the portion sizes aren't the largest, this is definitely a girlfriends-only brunch location and I could barely finish my plate through all of the chatter and giggles. 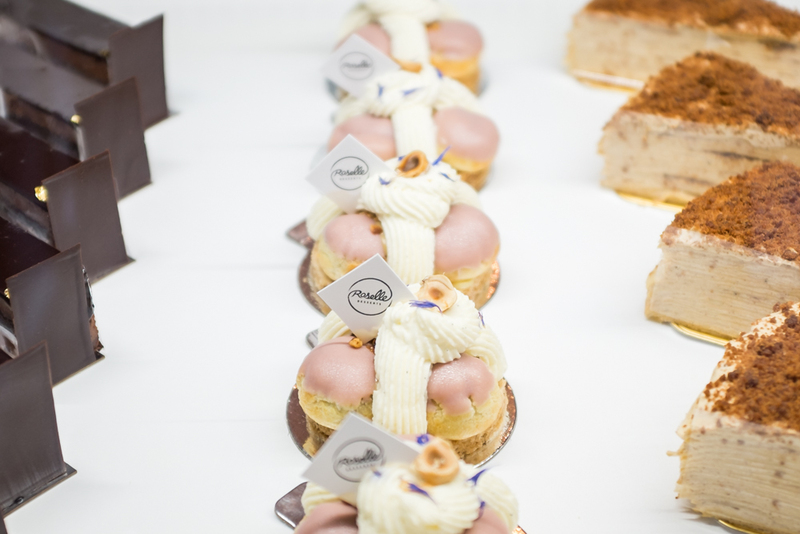 Colette Grand Café is definitely a must-try when you're in Toronto, and I am already planning my next visit. Anyone who follows me on Instagram knows that my weakness is definitely fresh flowers. I'm an absolute sucker for a pink rose and while I'm usually the one to arrange my own blooms, this month I received a bouquet from Flowers In The Box and was floored. The bouquet was so expertly arranged, achieving the sort of height and balance that I can never seem to get right. 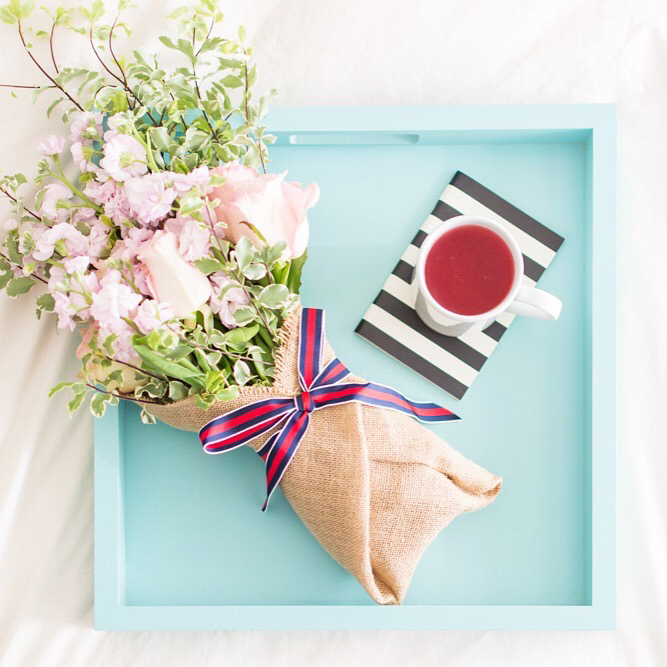 The presentation with a touch of burlap and an adorable ribbon was enough to convert me over to professionally arranged bouquets for good - or until I work on my own floral-arranging skills! You can order one of these gorgeous arrangements, or send one to someone you love with Flowers In The Box. Oh matcha lattes - my greatest weakness after fresh flowers and gin. Lucky for me I live in a city absolutely bursting with amazing cafés, but it's incredibly hard to find one that makes a decent matcha latte. 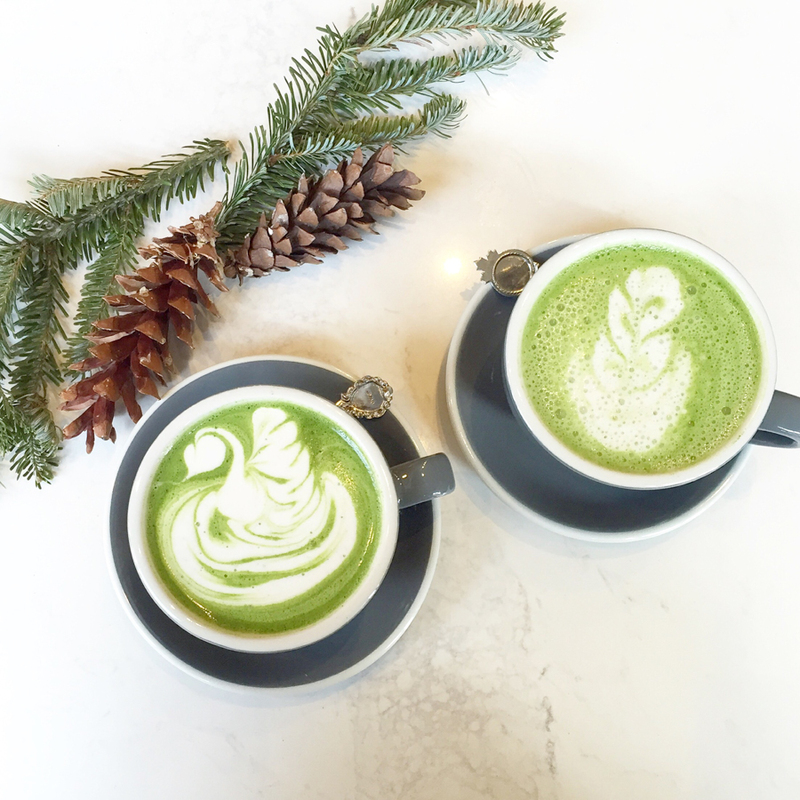 Neo Coffee Bar makes a mean matcha latte and the best part is that they're located in my area of Old Town Toronto - score! If you're ever in the area, make sure to give them a try. 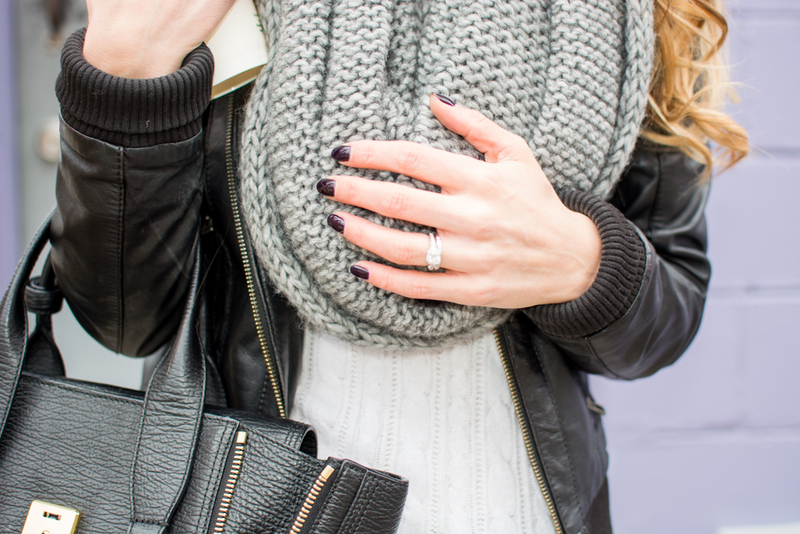 While I've never been one to wear a ton of accessories, I've been gravitating towards rings lately - probably since I've been trying to grow out my nails. Pandora recently has stepped up their game in the ring department, and their stackable rings are absolutely beautiful. The quality is hard to beat, and the silver rings come at an incredible price point. My Pandora rings are a gift from Brian (thanks Brian!) but I definitely plan to add a few more to add to my stacking set. That's it for December - what an incredible month! Stay tuned for my New Years post but until then, have an absolutely wonderful New Years Eve! I call it the black coat syndrome. Everyone that lives in a city with a colder climate can attest to it; once the temperature starts to drop, out come the coats - and those coats are typically black. I have definitely fallen victim to this dark phenomenon as I'm greeted by a sea of black when I open up our coat closet. Vowing to change up routine this winter, I managed to scoop up this light grey cocoon coat at the Aritzia boxing day sale. I absolutely love the oversized, boxy fit of this wool coat and it's a welcome addition to my collection of black winter coats. Paired with an array of grey knits and some black leather boots and accesories and I'm ready to take on old man winter - sans black coat. I've been really into rings lately, and these Pandora rings that Brian gave me for Christmas are absolute perfection! 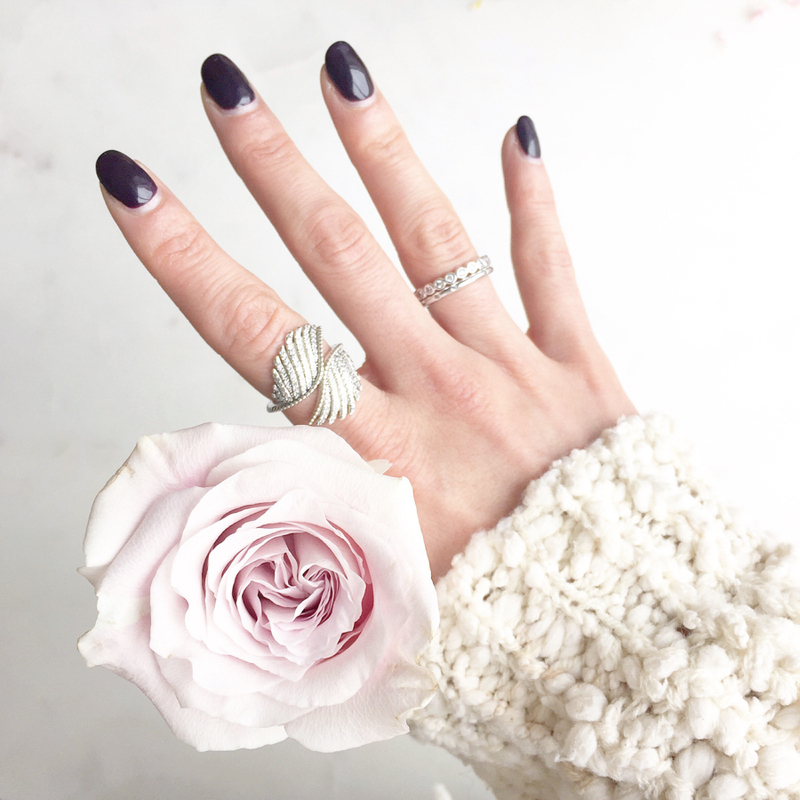 I love the delicate nature of the stacking rings, and the silver rings are absolutely beautiful in person. Winter may be in full swing, but I'm happy that I've found my alternative to the black coat. 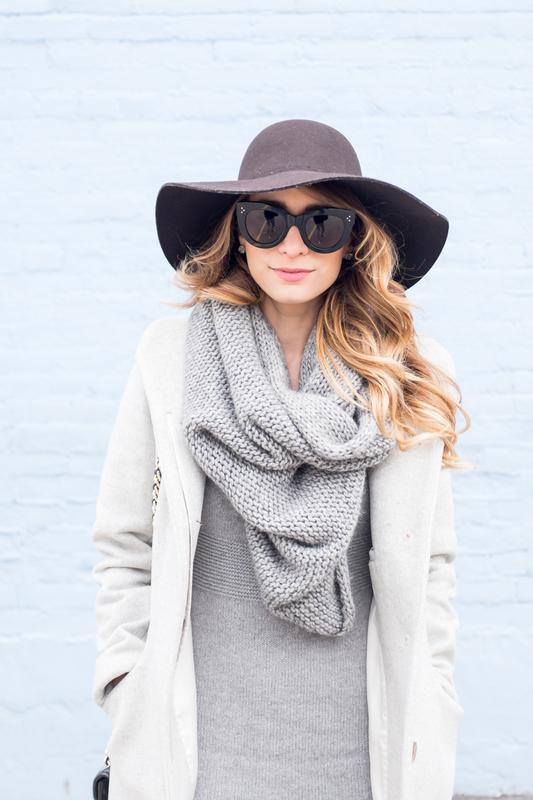 Do you gravitate towards darker shades in the winter? Let me know! I'll just come out and say it - I'm a purse stalker. Although my collection of luxury handbags leaves much to be desired, I love scouring the internet for images of beautiful purses and how their fabulous owners style them. I always just assumed that most luxury bags were way out of my price range and never even considered being able to have my own - until I found out about the world of consignment luxury goods. There's an entire world of consignment handbags out there, and when Love That Bag approached me to try out one of their gently used handbags I was ecstatic. Let me just say this - if this is the experience of consignment luxury goods, then I'm sold. The Céline Mini Luggage Tote in Midnight Blue that arrived was flawless; I'm talking perfectly buttery leather, great structure and a dust bag to boot. The best part is that these consignment bags are a fraction of the cost from retail in stores, so all of a sudden I have a fighting chance to bring one of these babies home for good. I was lucky enough to be introduced to LANGsura, an online retailer that is local to me from Toronto. I have to say as an admitted Zara addict, boutique shopping is a welcome change. 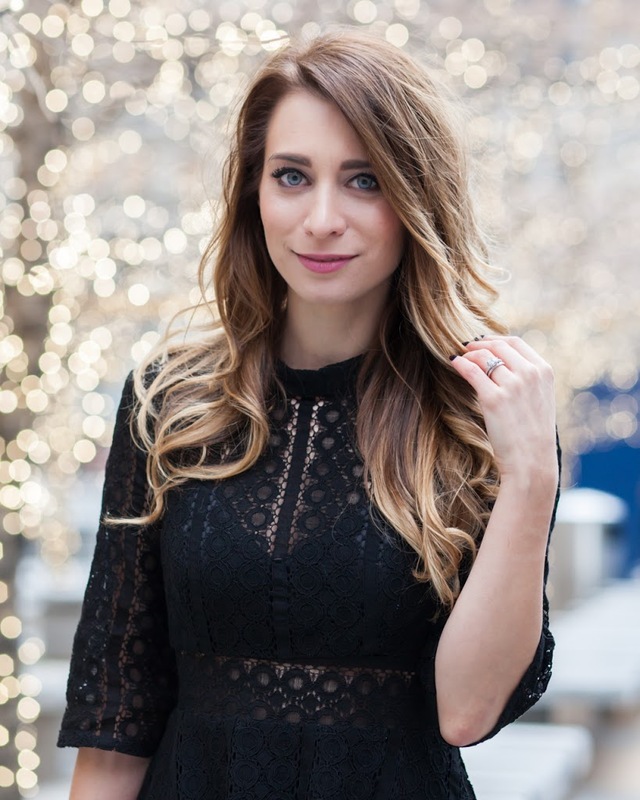 I love the variety you can find in boutiques like LANGsura and had the best time chatting with the ladies behind the store at their current pop up in Toronto (111 Roncesvilles Ave.) This black lace dress is such a unique piece and totally different than anything in my closet, a shopping win that's for sure! A photo of how I showed up to the photoshoot - bundled! Going back to my post on tips for taking outfit photos in the winter, sometimes you have to go sans coat and just smile! Between a beautiful handbag and a fun dress, it's definitely been a great week. Have you ever tried consignment luxury goods? What was your experience? Do you prefer boutique shopping over the big retailers? Let me know! The warm front we have been experiencing in Toronto made a sudden exit this past weekend, and left chilly weather in its place. I had plans made with local blogger babes for brunch, and didn't want to show up in your typical parka and boots - how boring, right? Instead of your typical cold-weather uniform I opted to layer knits underneath a leather jacket, replace the boots with some fun leopard pumps and top it all of with a pom-pom toque (that's Canadian for beanie.) While it was cold, and I look borderline freezing in these photos, it actually wasn't so bad; its amazing how wearing a warm hat can make a world of a difference! Winter may be well on it's way, but with strategic layering and warm accessories you don't need to sacrifice style in the cold. Those of you who follow me on Instagram may remember that I was debating whether or not I should sell my beloved 3.1 Phillip Lim Pashli. As much as I love this bag, I was growing tired of it and thought that selling the purse to invest in another may solve the problem. Enter the purse pom - now that I have this fun accessory hanging from my Lim, I feel as though I have a whole new bag! For now, I'm holding off on selling the bag and have been enjoying it with the pink pom from Mendocino. For those of you who have older handbags that you've grown tired of, give a purse pom a try - it may be just the trick to breath life into an old bag! Sure it's not the most appropriate cold-weather outfit option but I'll sacrifice a little fashion for function, especially when brunch is involved! How are you coping with the colder weather? Let me know! Well it's official - after renewing my domain name that I registered for exactly two years ago I'm excited to announce in disbelief that this is the 2nd anniversary of La Petite Noob. As I sit and reflect on what an incredible journey blogging has been, I can't help but be filled with warm fuzzies and love. Blogging certainly has its ups and downs, but the positives far outweigh the negatives and I am honoured to be a part of this wonderfully creative community. I've touched on the amazing friendships that I've made through blogging in my last post, but words cannot express how incredibly grateful I am to have you as a reader. Each and every comment and interaction that I have with all of you seriously means so much to me, and I hope that you know how much I truly appreciate your support. Thank you from the bottom of my heart for following me on this incredible blog journey, and for being there through the evolution of La Petite Noob - I can honestly say that I couldn't have done it without you. Now before I start bawling all over my laptop, let's get to the outfit shall we? As with all of the great milestones in my life, I turn to Honey stores here in Toronto to chose a dress that really makes me feel special. When I stepped into the girly-paradise that is the Honey boutique, I spotted this blush pink flowing dress and literally gasped - does this not remind you of something Carrie Bradshaw would have worn circa season 5? I absolutely love the delicate detail of the neckline and how the silhouette billows out like a pink dream; totally figure flattering, you can hardly tell that I've been binge eating pastries all day. Celebrating two years of blogging is so exciting, and doing so while wearing this gorgeous dress is icing on the cupcake. You guys know that I live in Toronto, and am a proud Torontonian. Part of the reason that I love my city so much is that there are beautiful spots to discover at every corner and Roselle in Corktown is no exception. I love stopping into this picturesque café on Saturday afternoons to pick up one of their house-made pastries, while soaking up the light and airy atmosphere while I wait for my treats. 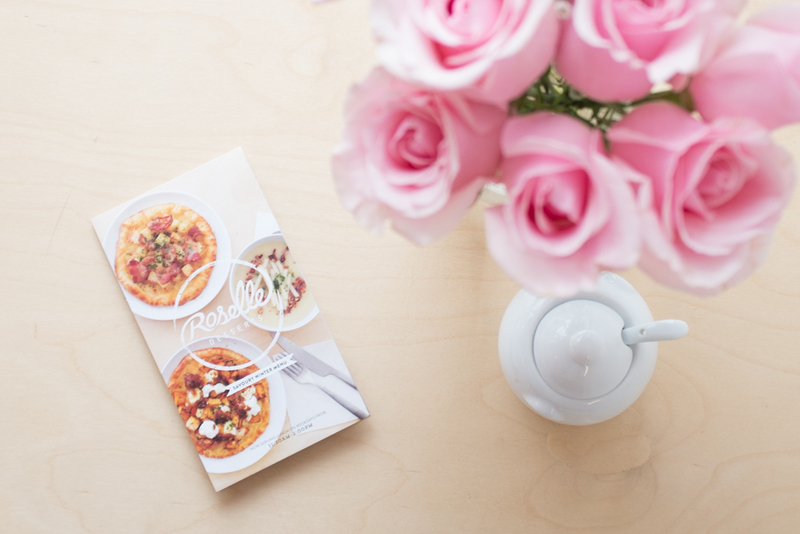 For those of you in the Toronto area, Roselle is definitely a must-visit! A beautiful dress, café and occasion - definitely lots to celebrate. Thank you again so much for your support through this incredible blogging journey. La Petite Noob would not be the same without you, and I look forward to what the future will bring! What do you get when you throw together 5 Toronto Bloggers, some amazing local businesses and champagne? 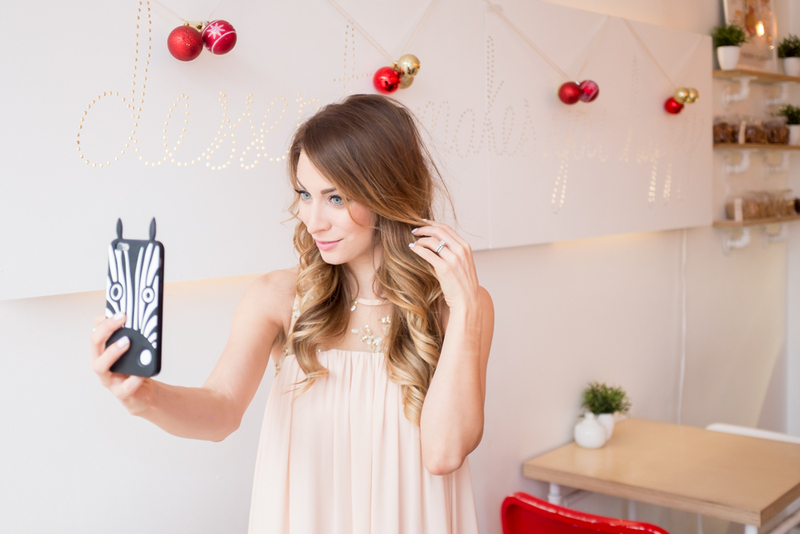 A holiday blogger photo shoot full of sparkles, giggles and love. One chilly December afternoon, some of the loveliest ladies I've had the pleasure of meeting on this blog journey and I took to the studio to celebrate the holidays in style. It really is incredible what can happen when you're surrounded by creative and talented ladies. 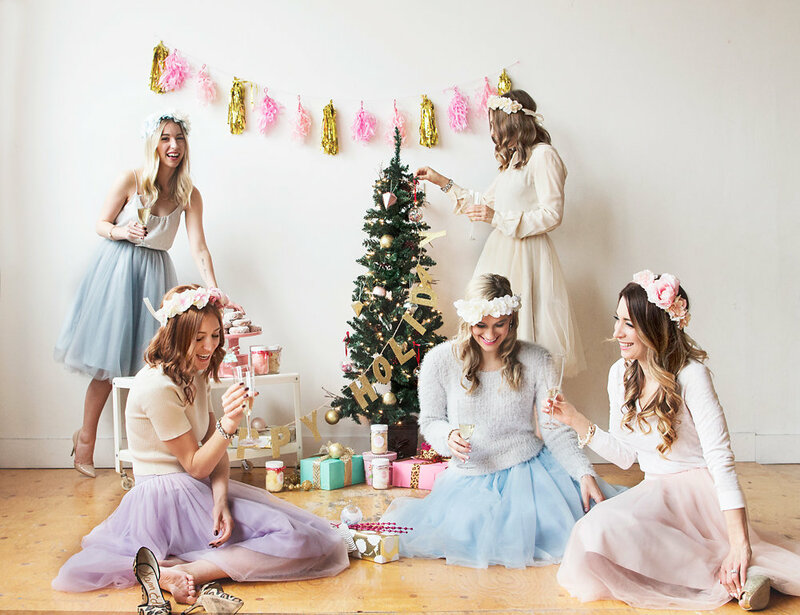 What was once a empty studio was quickly turned into a holiday wonderland, complete with pastel details, bling, donuts, champagne and lots of tulle. What started off as casual Instagram comments and blogger comments has blossomed into beautiful friendships, and I couldn't be more proud to stand and laugh next to these incredibly talented ladies. Read on to see the details and photos of this fun afternoon, and to get to know Gabriella, Amy, Eleni and Kaylee - plus Kaylee's incredibly gifted photographer sister Raelene Giffin. It's that time of the year - when Brian gets so excited for the holiday that he plays Elvis's Blue Christmas on repeat for hours on end. Not that I have anything against The King, but after I hearing this song for the fifth, sixth, seventh time in a row - I'm the one who's feeling blue! As a tribute to our condo's current soundtrack, I chose to break out my favourite light blue maxi skirt. Styling a maxi skirt for the winter is especially appropriate around the holiday season, as it adds an instant elegance to your outfit. 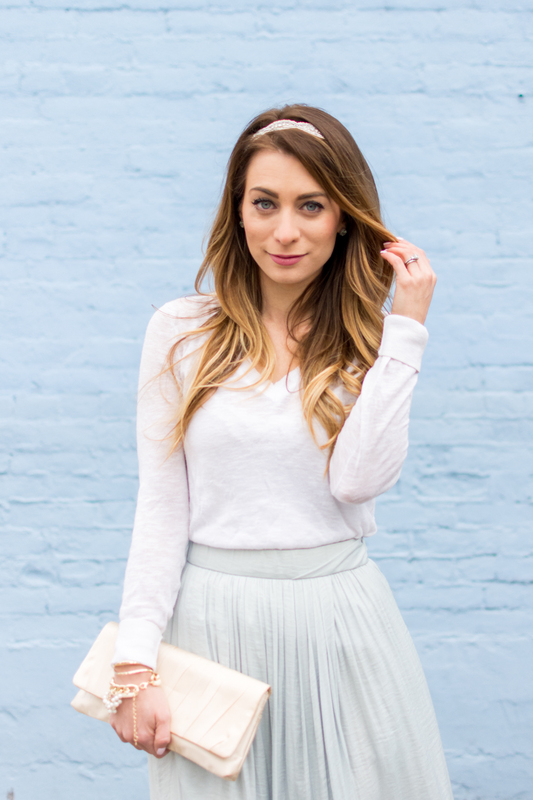 I like to keep things season appropriate by pairing my maxi skirts with some light sweaters. Add your favourite pair of heels and a sparkly headband, and you're ready to paint the town red - or in this case, blue. I don't know about you guys, but when I'm looking to get dolled up for a night on the town I don't start with my outfit - I start with my hair. There's nothing quite like leaving the house rocking a hair colour and style that you love to make a girl feel like a million dollars. Maintaining naturally long hair while still exposing it to colour processing can be tough - enter Pureology hair products. I was turned onto Pureology while looking for a haircare line that specializes in colour treated hair. After sporting an ombré colour for a few years now, I'm impressed by how much healthier my hair has become since using Pureology; seriously, my locks literally soak the products up and are left feeling so soft and manageable! Another thing that I appreciate about Pureology is the fact that they're vegan, which honestly is becoming more and more important to me as time goes on. With my new haircare routine, fresh colour and style (thanks to Luis Pacheco at Medulla & Co in Toronto), and an all-black holiday outfit I'm ready to hit the town! 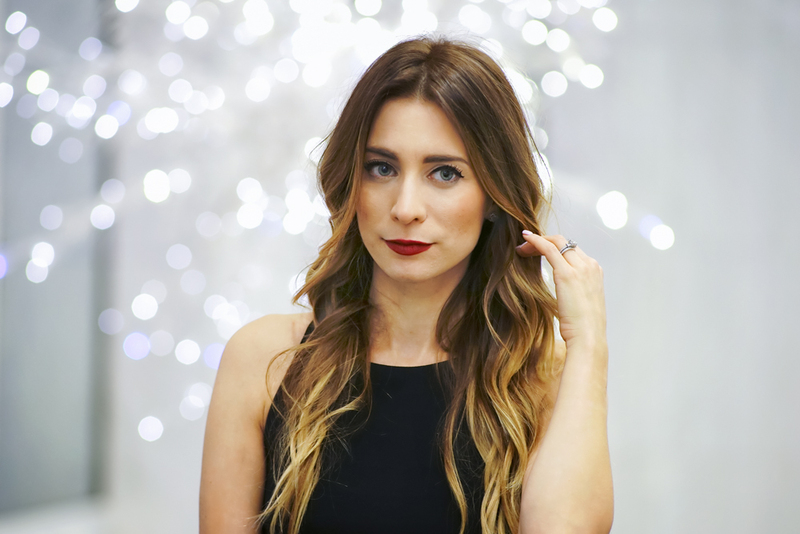 Keep reading for details on my hair colour, and a chance to win your very own Pureology Prize Pack - just in time for the holidays! I've been absolutely loving midi skirts since the summer time, and am happy to incorporate this style into a holiday outfit. This black midi skirt is perfect for a petite frame, especially paired with a black pump. The subtle amount of skin showing from underneath the crop top hits right at the smallest part of my waist and with the volume of the midi skirt it gives the allusion of a tiny frame - perfect for me, since I'm well into my holiday indulging already! Add a leopard clutch, some subtle gold jewelry and I'm ready to paint the town red in a classic holiday outfit. 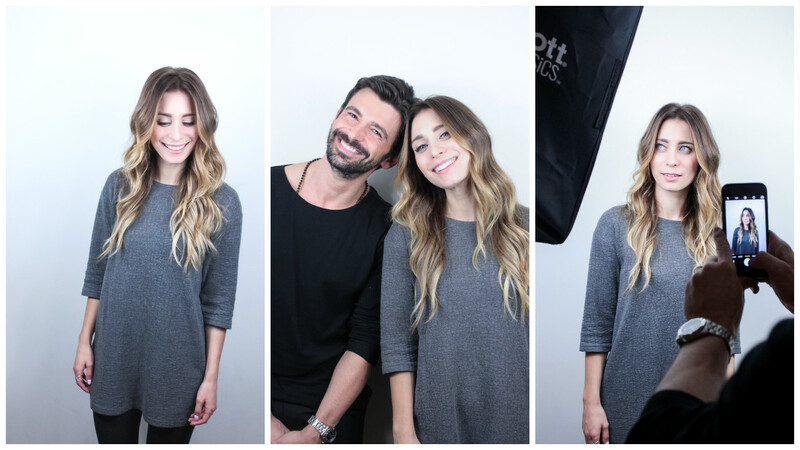 I'm definitely having way too much fun with my new hair colour, thanks to top hairstylist Luis Pacheco. Luis and his team at Medulla & Co. in Toronto's Queen West were absolutely wonderful, and ensured that I left with exactly the hair colour that I wanted - a brighter ombré with warm tones, and a rich warm base. Luis also turned me onto my new favourite Pureology product: the Colour Fanatic Hair Treatment Spray, a luxurious spray that adds an extra boost of moisture after a wash, and minimizes breakage as I comb through wet hair. I'm so excited to be able to give away an amazing Pureology prize pack full of the products that have transformed my hair! Enter below for details, and let me know if you also start off with your hair when getting dressed up for a night on the town. 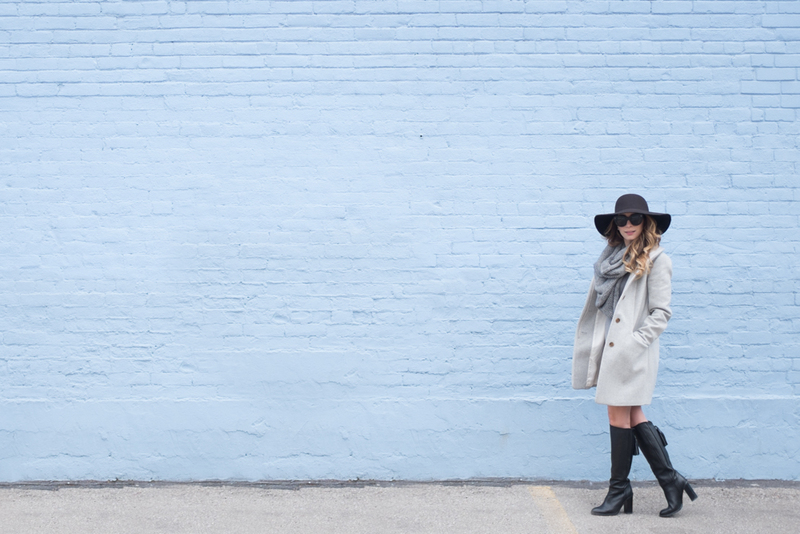 © La Petite Noob | A Toronto-Based Fashion and Lifestyle Blog.